Thread: Sturmgewehr brought to gun buy-back in the U.S.
A woman tried to sell a STG 44 at one of those silly buy back things held in Connecticut recently. Oddly enough, the authorities overseeing the silliness advised her to take it back home, and sell it herself as it was worth as much as $40,000 . Damn nice of the cops to do that.. A Google search will find the details if anyone is interested. Re: Sturmgewehr brought to gun buy-back in the U.S.
That would be a really good idea,There should be an adviser to speak to people regarding whats in their own best interests before they commit to selling a firearm to one of these buy up programs. As the purpose of these programs is to remove firearms from private hands, even though the stated aim of the program may be to remove them from the "Streets",there is no distinction made between legally owned private firearms, and those in the possession of the criminal, or otherwise unqualified person. The usual rule is that anything bought by the program is required to be destroyed . So yes, it would be good to have some type of alternative available to those who bring something of significance to one of these silly events. Just like a scene out of "Antiques Roadshow," a woman in Hartford, Conn., turned in an old rifle to her local police station's gun buy-back, only to discover the gun was worth anywhere from $20,000 to $25,000. The woman, who wishes to remain anonymous, inherited the gun from her father who had brought it home with him from Europe as a memento from World War II. 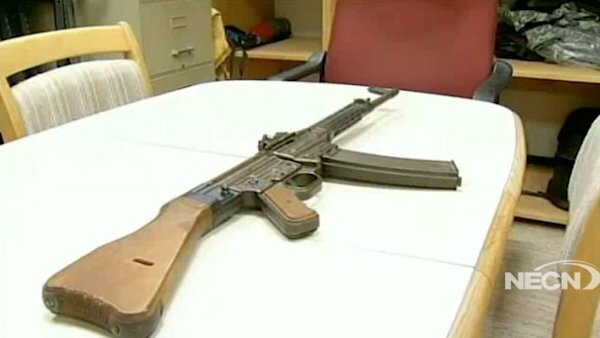 The two officers conducting the gun buy-back, who are resident gun experts for the Hartford Police Department, informed the owner she was in possession of a Nazi Assault Rifle, the first of its kind, that dates back to 1944. The gun is called a Sturmgewehr 44, literally meaning "storm rifle," and is the first "modern assault rifle ever made, eventually replaced by the AK 47 in 1947 by Russia, who copied the German design of the Sturmgewehr 44," Officer Lewis Crabtree, one of the two officers who discovered the gun, told ABC News. "It's like finding the Babe Ruth of baseball cards," said Officer John Cavanna. "The rarity, it was made for such a very short period." Most people, however, who aren't avid gun fans would have no idea what role this gun played in history. "If you were to look at the gun and didn't know anything about guns, you would think it was garbage," Crabtree said. That is essentially what the owner thought the gun was, bringing it to the station knowing full well it would be put into a smelter, melting the gun down into an iron brick. "People turn in guns for a variety of reasons," Cavanna told ABC. "They don't have a good way to secure it, they have kids around their home, or they don't know how to use it. This is an anonymous way for someone to take an unwanted firearm and get it off the streets. We then give them a $50 or $100 gift card to Wal-Mart." Crabtree attributes gun accidents to ignorance and carelessness. The anonymous gun buy-back program is aimed at preventing people from running into potentially dangerous situations with a gun they don't know how to use or work. This seems to be the reason the woman who dropped off the historic rifle. "Her father passed away. The gun was in her closet," Cavanna said. "She did not know it was a machine gun. "If the gun had been in the closet loaded, any second you could hit the wrong level and discharge a fatal round," he said of the Sturmgewehr 44. This German-made machine gun can fire 500 rounds in minutes, according to Cavanna, who is also a gun range master. At the time the officers received the gun, it was in such disrepair that it was inoperable, unable to shoot a bullet even if the gun had been loaded. Cavanna said ammunition would have to be especially made for this gun. The unnamed owner of the gun has left the valuable artifact at the police station for safe keeping. "We did not take the gun in for the gun buy-back program," Crabtree said. "If we took it as part of the buy-back, we would have no choice but to destroy the gun. We don't want to destroy that gun." The owner intends to sell the Sturmgewehr 44. "It sounds like her family could use the money," Cavanna said. ...The woman, who wishes to remain anonymous, inherited the gun from her father who had brought it home with him from Europe as a memento from World War II. I was curious about that part myself Nick, unless he could get it registered under the M.G. Act of 1934, (assuming it was still serviceable ) I don't know how they could authorize it. That they would return it to her must mean that its either properly papered, or a DeWaT. Either way, it would be nice to have it in appreciative hands. The one good thing is that even in the case of a contraband weapon, the BATFE will generally not destroy a device of significant historic value, and place them in their own research collection, or in a museum. Either ABC were deliberately misquoting Offrs Cavanna and Crabtree to make them sound stupid, or the Hartford PD need desperately to find some 'gun experts' who actually know something about their subject.